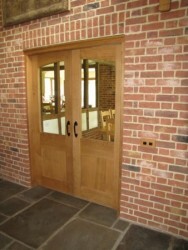 If you would like some special internal timber doors we can manufacture these for you. Whether they are a non-standard size, you want to match something or you just want to personalise your house. We have many patterns you can browse through and we are happy to work with you to achieve the design you want. From Shaker Style to fully glazed or four panel – the choice is endless. In addition we can match mouldings, skirtings and architraves to suit. Doors can be fully spray painted if required to match any BS or RAL colour.